Alternative sleep aids on this website will be defined as aids that are not prescription drugs or over the counter sleep aid medicine. However, just because supplements are "natural," they still need to be taken with caution. Even all natural supplements can interfere with other medications you are on or have side effects. They also need to be taken as directed and in conjunction with a discussion with your physician. 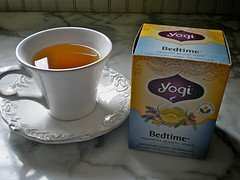 Herbal teas, vitamins and minerals and a sleep diet can also enhance a good night's sleep. 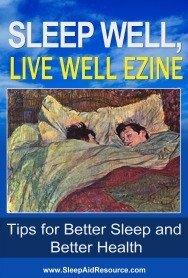 If you are like me, you want to try natural sleep aid remedies before you resort to sleep aid prescriptions. What you may find is that it's going to be a combination of adding foods and supplements and eliminating other foods and beverages. Don't be seeking a "magic pill" to treat your insomnia. There isn't one and looking for one won't get to some of the root causes of your sleeplessness. You may have heard of all other kinds of diets to loose weight, decrease inflammation, or reverse heat disease - but did you know that a sleep diet may help to restore a good night's sleep for you? Sugar causes stimulation which can prevent us from falling asleep. Just ask teachers what kids are like in school the day after Halloween. Sugar makes us hyper - and not just kids. Minimize and limit the number of desserts and other sources of sugar you consume. If you are going to have a treat - eat it at noon and not after supper or in the evening. While my other friends are slowing down as they age, I seem to be getting more hyper and rarely feel tired. While you may think this is a good thing, it really is not "normal" to not feel tired at night. It's a kind of false energy. So instead of adding more "hyperness" (is that a word?) by drinking coffee or soft drinks, I reach for calming teas like chamomille tea or valerian root tea. On a rare occasion when I do have a couple of cups of real coffee, I can really feel myself getting more hyper and my heart starting to race. Our sensitivity to caffeine changes as we age. In the past I could drink real coffee and fall asleep an hour later. When I started developing sleep problems I cut out all caffeine - even decaf coffee which still has some caffeine in it. All I can say is that I believe this is one of the many things I have had to change that has helped to restore my sleep. Deficiencies in certain vitamins, minerals and fats can contribute to sleep problems. 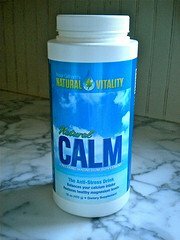 Inadequate levels of magnesium, calcium, vitamin B's and omega 3 fatty acids can all play a part in how we deal with stress and in our ability to relax. Ideally it is best to get our nutrients from food. You will find that organic food sources are typically more nutrient dense than non-organic foods. However, supplements are often needed in addition to a healthy diet to provide the needed nutrients our bodies need. The ones that have helped me are magnesium, vitamin B's and omega 3 fatty acids. Herbs that are known to help with sleep are chamomile, kava kava, lemon balm, valerian root, lavender, passionflower, and St. John's Wort. There is a lot of information to read regarding these options. The best advice is to do your research, but try implementing lifestyle changes first to find the root causes of your sleep problems. Taking a herb at night can't replace the need for exercise, exposure to sunlight, or meditation and relaxation. Valerian root for insomnia can be found in teas and sleep supplements. The roots of this European plant are commonly used in sleep teas. However, not being a very tasty plant, teas are usually made of chamomile or other sleep herb. Some studies show that it is helpful in inducing sleep and other studies have not proven its effectiveness. Side effects that have been reported by clinical trial participants are headaches, hives, dizziness and gastrointestinal problems. However, those taking the placebo experienced similar effects. Melatonin is a hormone secreted by the pineal gland in the brain. It peaks at night and helps to regulate our sleep-wake cycle. 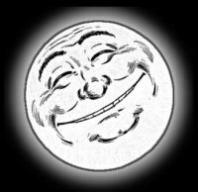 With darkness the hormone is triggered and then decreases with light. When light hits the photoreceptor cells located in the retina, signals are sent to the brain. These light signals and the strength of the light impact melatonin production. Melatonin is often considered one of many alternative sleep aids. But remember, melatonin is a hormone and and just because it's more "natural" than a prescription drug, doesn't mean it's safe to take every night or for long term use. Consult with your health professional before taking even over the counter sleep medications. There are different doses of melatonin that are available as well as a time released melatonin. Even this sleep aid is meant to be taken for a short term such as during a stressful or difficult period in your life.